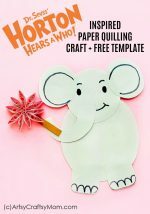 There’s no fear of pricking your fingers with this Paper Quilled Hedgehog Craft!! 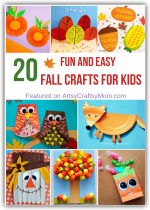 Easy fall craft for kids, or to learn about woodland animals. What’s the first thing that comes to mind when you think of a hedgehog? Pretty sure it’s all those spines you’re thinking of, and you can almost feel them prick! Yes, hedgehogs do have lots of spines (about 5,000), but they’re pretty gentle animals. They just go about minding their own business and eating bugs, without harming anyone. And if anyone tries to harm them, they just coil themselves into a little round shape! And today, we’ve got some coiling of our own going around here – with our easy fall-themed Paper Quilled Hedgehog craft! 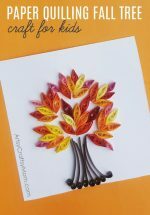 You know we love Paper Quilling Crafts and this one’s quite an easy one too. 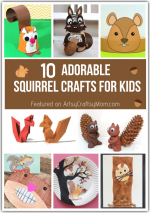 Whether you’re learning about woodland animals or looking for Fall/Autumn Crafts, this is one you have got to try! 1. We start out by making the base for the hedgehog’s head and body. Here we’ve used a light brown 18″ strip for the head and a dark brown 20″ strip for the body. Create loose coils with both strips. 2. Squeeze one end of the light brown coil to create a pointy edge. 3. Do the same at two other ends of the coil, so that you get two more pointy ends, creating a rough triangle shape. 4. Take light brown strips of 2″ and use them to create more small triangle shapes. These are going to be the spikes of the hedgehog. Make as many as you need. 5. Time to make the other body parts of the hedgehog. For this, use 3 black quilling strips of 4″ to create tight coils. Two of these will be the legs and the third will be the hedgehog’s nose. 6. Our hedgehog is two dimensional, so we’ll need just one eye. Cut out a circle from white craft paper and a half-smile shape from pink craft paper. Make sure the sizes are in proportion with the hedgehog’s body and head. 7. It’s time to put everything together! Choose a sheet of craft paper in a dark color and glue the body and head quilled coils that were created after the first three steps. 8. Now carefully cut the craft paper around the hedgehog’s body and head. Glue the triangular spikes on top of the hedgehog’s body, starting from the middle towards the back as shown in the picture below. 9. We’re almost done! Stick on the eye and mouth on the hedgehog’s head. Attach the nose and the legs in the appropriate places. 10. Let the hedgehog dry completely. 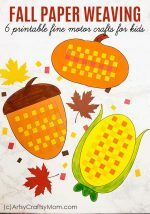 Transfer onto a fall-themed background – it can be plain brown, orange or yellow paper, or a patterned one with leaves. How cute are these little guys? We’ve given them a little hill slope to go climbing upon. If you’d like to get a little more creative with this paper quilled hedgehog craft, you can make a tiny little bow for one of the hedgehogs. 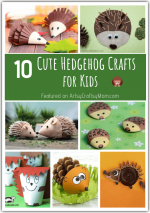 Or you could make a bunch of tiny baby hedgehogs (also called hoglets) – now, that would be adorable! You can use these hedgehogs as name cards for your Thanksgiving dinner, or on a greeting card. You can also attach little magnets to turn them into cute little keepsakes that you can give out as gifts!